The first three episodes are a prequel to the novel: The Starship Himilco (in two parts), and Conspirators. The Himilco is the first story James Prescott wrote about adventures of Earthmen traveling to Arcturus. This short story takes place in the 28th century, ten years before the events in the novel Between Earth and Arcturus, and was intended to be the preface to the novel. Conspirators was written to be the first chapter of the novel. These three episodes provide interesting backstory to the novel, but didn’t make it into the final draft. Gentry Stokes III was born in the year 2766 and is the son of the richest man in the galaxy. He is a young man troubled by superhuman strength which he must hide from the world and a belief that his grandfather was an alien. Unfortunately, scientific opinion has concluded that the probability of aliens in the galaxy is zero, so Gentry’s obsession with his ancestry lands him in mental hospital until Clifford Poluka gives him the opportunity to prove the existence of aliens. Gentry is a mathematics prodigy who, at the age of 19 years, finds a way out of the mental hospital and onto the Starship Himilco for the first manned mission to Arcturus. 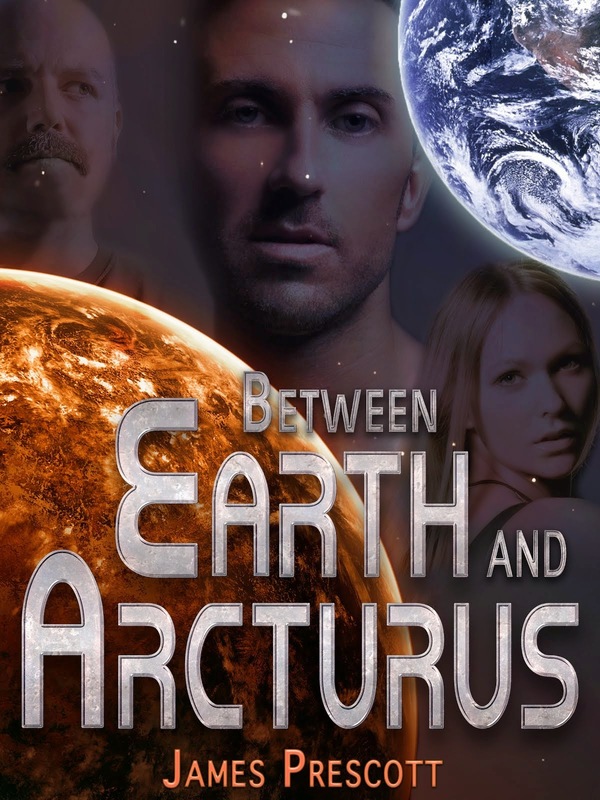 The novel Between Earth And Arcturus follows the adventures of Gentry's sister, Lynda, as she tries to discover what became of her brother. Gentry is making friends aboard the Starship Himilco during the long voyage to Arcturus. They must pass through the Zone, which no vessel has ever survived before. When they find the Himilco cannot maintain a constant speed they discover the secret of the Zone that destroys every probe sent there, as well as proof that aliens exist. Meet Clifford Poluka’s younger brother, Paul. It’s been ten years since the Starship Himilco disappeared along with Cliff and Gentry. Paul left the Navy and is now a captain in the Exploration Corps. He is also conspiring against the government with Gentry’s father and sister. Here we also meet Lynda Stokes, 22 year old daughter of G.J. (Gentry junior) Stokes who is the head of Stokes Enterprises and the designer of the newest and best starship. Lynda is a prodigy with great intelligence, but can’t cook worth a damn. This chapter was originally written to be the first chapter of the novel Between Earth and Arcturus, but did not make it into the final draft. This is the first chapter of the novel Between Earth and Arcturus in its final draft. Here we meet Commander Aguire, a young over-achiever in the Exploration Corps. Upon returning to Earth after a long mission, Aguire finds the old Federation has been swept away by a bloody coup and his career is in jeopardy. He expected a promotion to captain of his ship when his captain, Paul Poluka, is assigned to a new ship, but he may end up working for a sadistic admiral instead. Chapters two and three tell of how Lynda Stokes objects to Paul wanting to bring Aguire into the rebellion, but finally agrees to check out José Aguire and, possibly, allow him to join Captain Poluka on the new ship, which will put Aguire on the path to treason whether he likes it or not. Aguire goes to the Spaceport in Kansas to pick up Captain Poluka, where he runs into a policeman whom he knows, and learns that the New Federation is arresting people for protesting, people who are never seen again. Aguire learns more about the new government and he finds he has a new path to follow, still unaware that he is being manipulated. (Note: The policeman, Mike Sullivan who is only briefly seen here, will be a major character in the sequel novel, Pioneers Of Arcturus). Elisa Santino was a top-notch deep space rescue officer before the coup. Now she’s miserably enduring a desk job under Admiral Fisher. But she has a plan; she discovered that G.J. Stokes and Captain Poluka are going to great lengths to hide the true design of the Starship Hanno and, since Stokes is the richest man in the galaxy, she figures he will pay to keep his secrets from the New Federation. She hacks into secret files and begins collecting information, while keeping it from being discovered by anyone else. Though scheming to be a blackmailer, Elisa is not all bad, and tries to help a young intern stay out of trouble. This is chapter 5 of the novel Between Earth and Arcturus by James Prescott. Admiral Higgs takes Admiral Fisher to the capital of Earth, West Point, where we meet Vice President Batastia and the inner circle of evil men who now rule the known galaxy. Admiral Higgs has taken Fisher under his wing to guide him up the through the ranks, but is beginning to realize that Fisher is a monster. Elisa Santino continues her plot to blackmail G.J. Stokes, unaware that she has been marked for death by the vice president. Things take a dark turn when her efforts to protect Julie from Admiral Fisher fail, and Fisher's perverse pleasures go tragically wrong. This episode is actually three very short chapters, 7 thru 9. The first follows Captain Paul Poluka as he takes Lynda Stokes to dinner in an attempt to change her mind about allowing Commander Aguire to serve aboard the Starship Hanno. Part of the problem is that their secret conspiracy depends on getting only people whom the evil government has blacklisted, but Lynda doesn't know who's on the blacklist. The next chapter drops in on Admiral Higgs, who is finding unexpected troubles both with his protégé, Admiral Fisher, who has just murdered Julie, and with the vice president, who has just murdered thousands. Finally, we get our first glimpse of the alien queen in the shortest chapter of the novel. Much more about this queen will be learned in later chapters. Commander Aguire is allowed to train at the academy for duty aboard the Starship Hanno, and is tutored by Lynda Stokes, unaware that her real purpose is to evaluate him for a role in a conspiracy against the New Federation. We get a closer look at Lynda Stokes as she reveals some of her concerns and her feelings about her missing brother who was featured in the prequel episodes of the Starship Himilco. Lynda is young, but already committing her life to a rebellion and is responsible for choosing a crew for the new Starship Hanno. A wrong choice could leave the conspirators with a crew which might turn against them when they learn the truth. Lynda Stokes has four things in common with her brother Gentry who disappeared in the Zone ten years ago: She's smart; she's fast; she's got superhuman strength; and she's prone to violent outbursts. Too bad Captain Frazya didn't know this. Join our explorers for a gala event at the commissioning of the Starship Hanno. Commander Jose Aguire and his buddy Leroy Donno still have no idea that Vice President Batastia and Admiral Fisher expect the entire crew of the new ship will die because of design flaws, and have selected only people on their Black List as crew members. Batastia picked the date of the commissioning to coincide with the World Cup Football playoffs (in Leicester this year, which is, by the way, not far from where the author's ancestors came from) so that there will be very little news coverage, making it easier for the public to forget all about the doomed spacemen. Commander Aguire finally sees the Hanno for the first time. He begins the onloading of supplies with the help of Lieutenants McGee and Swanson using "smart machine" technology, which has been banned since the Corporate War 40 years ago because of how that worked out with the feared robot soldiers of the past. But this time it will just be used to automate electric trucks, so it should be fine, right? Take a tour of the giant ship with Aguire and Martensen. Aguire learns that a hero whom he met years ago at the Last Stop hub station is a crew member...and has been demoted twice by Admiral Fisher. This leads him to a disturbing discovery while reviewing the ship's personnel records. Commander Aguire confronts Captain Poluka about the New Federation's intentions, and Poluka begins to wonder if it was a mistake to bring Aguire into the plan. This episode gives the first clue about what will eventually destroy one of these men. Elisa Santino, Luther Braun, and Bart Hanson go to Earth to hack into the Attorney General’s computer files and find that time has run out for the conspirators. Hanson has his own agenda which leads them to a man who doesn't want to be nice to Hanson, the most dangerous man on Earth. The light cruiser that Bart Hanson brought onboard the Hanno proves useful in distracting Commander Aguire for a few hours while Captain Poluka finds a way to flee Earth without making his officers suspicious. Lynda becomes way too obsessed with the mystery of Elisa's popularity. The Starship Hanno flees Earth as the conspirators try to keep the crew in the dark about what is happening. Commander Aguire takes the Starship away from Earth before time runs out, and GJ Stokes's creation does the impossible. Unfortunately, it lands them in the same situation that killed every other ship that entered the Zone. Take a peek into the background of the super warrior, Bart Hanson, and find out what worries have been haunting Captain Poluka. A visit from G.J. Stokes reveals what has been kept secret from the world, and from G.J. 's daughter Lynda. Another ship is in the Zone and Lynda finds the implications disturbing. A relic from the missing Starship Himilco is sighted. It's time for three lucky people to get into spacesuits and make their way through eleven kilometers of jagged asteroids to check out an alien spaceship that they know nothing about. It's dangerous enough without sending two women who are enemies. Donno, Lynda, and Elisa put on spacesuits and go out to investigate the alien ship. Elisa is terrified of Lynda, who is prone to violent outbursts. Just as Lynda, Donno, and Elisa reach the alien spaceship, a disaster leaves them stranded, and Aguire must take the light-cruiser to rescue them. The Hanno is seriously damaged, and Lynda's feelings finally awaken. The explorers of the Starship Hanno recoup after a tragic loss, and consider what to do with the alien ship. Lynda Stokes begins wondering if maybe her brother was right when he claimed that their grandfather was an alien. Captain Poluka is falling into his old tricks of keeping secrets from his people. Lynda is frustrated with her father and goes to Bart Hanson to learn the truth about her brother and herself. Everything she has always believed is torn apart. Lynda Stokes now sees everything in a new light since learning the secret of why she has always been different from other women. The officers of the Starship Hanno are finding their captain's behavior suspicious as Poluka rushes to move on to Arcturus, bringing the alien ship with them. Lynda is getting comfortable with being human now that she knows she's part alien. The damaged alien ship is inside the Starship Hanno as artifacts from inside the vessel are being studied. Captain Poluka has a few drinks with an old friend and reveals the pain he holds inside concerning his long lost brother. Engineers Braun and Tran have found a message left with the alien ship from Captain Poluka's brother Cliff, but are afraid to tell Captain Poluka about it because of the captain's erratic behavior. Commander Aguire gets his first look inside the alien ship. The Starship Hanno finally arrives at the Arcturus star system. They know aliens are here somewhere, but can't quite find them. No need, however, because the Queen of Arcturus, Lapastra, finds the Hanno the moment they arrive. The King, Elpastre, has just received an unpleasant message from the Matriarch of the Old Rulers, who is the bitter enemy of the king and queen. Now, Elpastre must tell his wife, Lapastra, about the Matriarch's offensive offer. The crew of the Hanno finds letters left by the crew of the missing starship, and the answer to where the aliens are. Commander Aguire uses the starship's remote probes to study the atmosphere of Arcturus-4, but Captain Poluka is in a rush to get down to the planet surface to look for his brother Cliff. A shuttle mission into the atmosphere of Arcturus-4 takes Commander Aguire to the mysterious barrier high above the planet's surface. Lynda sees that something has gone wrong with Captain Poluka. Aguire and his team crash land on Arcturus-4 after seeing what appears to be farms on the planet. Newhall is injured but alive. They repair the shuttle and decide to take a look at those farms. Our explorers find the planet is not as friendly as they had hoped. Aguire's team takes a walk in a forest while Sheffield's shuttle ends up in the sea. Unplanned and unprepared, Commander Aguire makes contact with aliens on Arcturus-4. Captain Poluka takes the cruiser, El Toro, to look for his missing shuttle teams. Aguire's and Sheffield's shuttles are missing and possibly under attack. Poluka's mind is not working at it's best and he knows it. Captain Poluka is intent on finding his missing people. Too bad he's exhausted and having psychological problems. In this episode we finally catch up with Lyndas's missing brother Gentry. It's also the first time we see the Himilco's complement of Army personnel in action. See how things get better for Bart Hanson. Captain Poluka finally meets up with Lynda's missing brother, Gentry. They fly east to an Arcturusian hospital, and to meet the king and queen of the planet. The King of Arcturus, Elpastre, gets to speak with the explorers before the Old Rulers know what is happening. Commander Redbird arranges it so the meeting happens before Captain Poluka can recover. G.J. and Lynda Stokes go to the planet and are reunited with Gentry. Elpastre tells the Earthmen about the calamity that shaped the culture of his people thousands of years ago, when the planet's oceans circled the world from the tidal influence of the moon. Commander Aguire confronts his captain concerning his drug use, and then Captain Paul Poluka meets his brother Cliff after ten years of wondering what became of him, only to find the answer disturbing. The counselor to the Grand Matriarch of the Old Rulers comes to the village of Arvod on the western coast of Vodita to persuade Captain Poluka against the plans of Elpastre. This is our first encounter with the people who have waited thousands of years to topple the benevolent monarchy of Arcturus and reclaim the power they had during the Epoch of the Flood. Captain Poluka finds their arguments compelling enough to risk offending the king and all of the alien population, not to mention making his credibility among his own officers even worse than it already was. Note to my Russian listeners: Sorry about the lawyer's unfortunate name. It is an accident of language that his name sounds like something disgusting in the Russian language. Ivan Tershensky is constantly amused by it. Jayne Payne forces Captain Poluka to get a complete medical examination after the captain causes a diplomatic incident. The monarchy of Arcturus needs to deal with a diplomatic incident caused by Captain Poluka. The Queen has a plan that will not only help the hundreds of wounded Earthmen, but also generate good will among the crew of the Starship Hanno. This episode brings back Ivan Tershensky, who last appeared in the prequel story Starship Himilco. Our roguish Russian spaceman has been a busy boy in the last ten years. There are now two groups of aliens aboard the Starship Hanno: The official diplomats meeting with Captain Poluka, and the Arcturusian doctors who are charming the crew, each doing what they can to persuade the captain. It will take something a bit more forceful to get results, and the force will come from an unlikely source. The alien delegation asks about Earth's primitives before returning to the planet with injured crewmen from the Starship Hanno. Meanwhile, Popa Utirka gets an unpleasant command from the Grand Matriarch. The royal chronicler, Eeja Burr, discovers the Grand Matriarch's plot. Despite his attempt to stop the mischief, Captain Poluka still gets the blame. The fire on the pier ruins the king's plans for diplomatic relations with Earth. Back on the Hanno, Elisa learns of Debra's latest lust interest, and Blossom Hill has a thing or two to say to her superior officers. With nothing left to screw up more than he already has, Captain Poluka takes the Starship Hanno back to the mysterious Zone to see what the automated probes have learned. Gentry Stokes and his Arcturusian wife and children go with the Hanno, but Commander Washington is uneasy about the existence of aliens and intends to investigate further. Meanwhile, Captain Poluka has changed his mind about the direction of the conspiracy against the government of Earth and now wants to attack the defenses of Earth. This sets the stage for a confrontation between Poluka and Aguire as the crew and officers begin to choose sides. Commander Washington gives everyone something to think about at the debriefing meeting after leaving Arcturus. Gentry and his family are especially concerned about what Washington thinks should be done about the Arcturusians, and he tells a small audience what he learned about his ancestors, the Erosians. Commander Redbird seeks guidance from Aguire as the captain prepares to take them into a hopeless battle, and Aguire learns that Luke McGee was arrested. Doctor Jayne Payne tries to relieve Captain Poluka from command, with disastrous results. The Ship's Police and the Army detachment need to restore order aboard the Hanno. Commander Aguire has made his choice, and now Captain Poluka is his enemy. The crew is divided and must fight for control of the starship. Admiral Higgs must cope with rebel forces which are attacking the evil regime of Vincent Batastia. His efforts are hindered by the insane dictator who has executed everyone who might be a threat, including many of officers that Higgs needs. The Starship Hanno reappears after sorting out who is in command of the mighty ship. Aguire fights for the freedom of Earth when the evil Vice President Vincent Batastia invites him to the Capitol. Admiral Higgs has already made his escape and will appear again in the sequel novel, using an alias. Batastia and Fisher have lost control of the government, but they still have a few tricks. Elisa Santino joins Commander Martinsen to track them down. The Batastia regime has collapsed. General Hebert and Commander Aguire are essentially in charge of the entire Earth empire for the moment, but they know their limitations and have no ambitions to replace Batastia as dictators. They need someone who understands politics, someone who can forge a new government from the ashes of corruption. They need a new Poluka. Aguire gets the best legal help money can't buy in his bid to claim ownership of the Hanno. He must face a panel of the Interim Government, who doesn't want to give up the ship. Our heroes have a little surprise for them when it turns out they may have to give up the Exploration Corps as well. Lynda made a valid argument for Captain Aguire's case, but the Governors may stall until they can find a way to keep their power. Bart Hanson's grandfather gives Poluka an idea how to get the Governors out of the way.